I cull tons of books from my potential read list every year, and don’t consider those “abandoned.” Only books that I put down after some serious investment fall into my abandoned list, and those books deserve some blog-time. Often, what makes them leavable for me might not bother someone else, and they might find their way into someone else’s hands if I give them little mini-reviews. The Shadow of Once Was Lost by James Islington – I grabbed this book because I was interested in branching out into big fat fantasy books that weren’t from authors I already know. While this had an interesting story and great writing, it didn’t work for me because I could see a ton of influence from authors like Robert Jordan and Brandon Sanderson, authors whose work I know pretty well. That made the book feel more like a reread than a first read for me, and I realized I wasn’t engaging with the story. If I’d read this years ago, I would have loved it, but timing made it not for me. I’m not discounting the possibility of returning to it sometime in the future for another attempt. 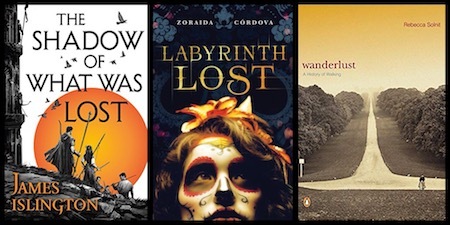 Labyrinth Lost by Zoraida Cordova – I love reading books about this kind of magic (bruja witches), I struggled with the portrayal here. I believe this is a combination of two things. First, I spent years in close company with a family who believed they were descendants of this kind of magic culture, and still claimed trace abilities that diminished with each generation. Setting aside the truth of those claims, I got a specific idea of the way the culture works, and this book seemed a highly sensationalized version. Second, there was a lot of YA-formulaic storylines, including the inevitable “they hate each other but will fall in love” and “perky outsider friend who comes to the rescue.” Those sorts of things don’t work for me. Wanderlust: A History of Walking by Rebecca Solnit – I believe I was actually 2/3rds through this book before abandoning it. At first, I loved it. Part one (of what I think would have been three) was awesome. Part two, not so much. It felt uneven, and I started to get bored. I kept going, thinking that things would perk up again in Part three, but they didn’t, and at that point, I didn’t feel like spending many more hours with the book. I got a great bit of information and new knowledge from the first part, and that’s good enough for me. Markswoman by Rati Mehrotra – I tried to read this one three times, but there was something about it (not sure what) that made it so I couldn’t get into it. Maybe it was just too similar to another fantasy-set-in-the-desert that I read earlier this year, a book that ended up being just-okay for me. I didn’t want to keep reading and have the same blasé feelings about this one. I’m sure other people would like it though, especially given that the other one that didn’t work for me was a real winner for many folks too. The Perfect Mother by Aimee Molloy – I’m not sure what put this on my radar, but it was a thriller during RIP time, so I took a chance. Listened to about 2/3rds, all the while with a strong guess as to what the twist would end up being. Finally, I looked up some spoileriffic reviews on GoodReads, because the book itself wasn’t really holding my attention but I still wanted to know if my guess was right. And it was, so I went ahead and put the book away. The Witch Elm by Tana French – I really tried with this one. It sounded like an interesting premise, but two things eventually made me abandon the book. The pacing was very uneven. The actual mystery portion didn’t begin until a third of the way into the book, and there would be portions of lots-of-drama followed by tons of nothing. The book was more literary fiction than mystery, and that would have been fine except that I couldn’t stand the narrator, Toby. He’s a spoiled, entitled white male (upper middle class, blond, good-looking, cisgender, straight, able-bodied, etc) who thinks the problems of women, gay people, mentally handicapped people, disabled people, poor people, and those with mental health issues are nonexistent, exaggerated, or “their own fault.” He spends so much of his time making casual nasty statements about these groups – especially disabled and mentally handicapped people – that I just couldn’t read further. I know that this is a book about such white entitled men and that French was making some very specific statements. We’re not meant to like Toby, and her writing and characterization is excellent. But damn I couldn’t spend another second with that a-hole. 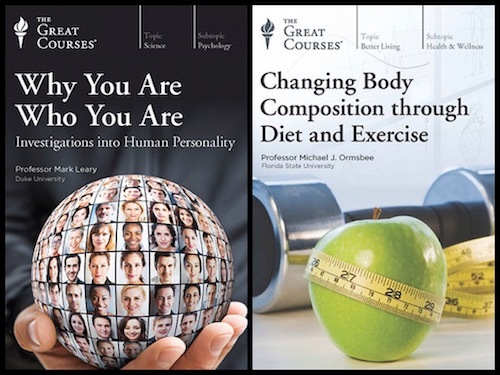 Why You Are Who You Are: Investigations Into the Human Personality (Mark Leary) – I love this topic but the lectures themselves were way too simple/basic, probably because I studied advanced psychology and sociology in school. I was also not a fan of the lecturer’s speaking style, something that’s hard to get past in an audio setting. Changing Body Composition Through Diet and Exercise (Michael Ormsbee) – This one had some interesting insights on nutrition and health, but it also made statements like this (paraphrased): “Many people recognize pasta, bread, and even potatoes as carbohydrates, but fruit is also a carbohydrate.” The mix of information taught in elementary school with advanced body science made the lectures uneven, and eventually the snippets of new-to-me insights weren’t enough to keep me wading through the rest. It didn’t help that the lecturer stated up front that most of the research was done on men and therefore may not apply to women anyway. Made me feel like perhaps I’m the wrong target market. This entry was posted in Book Talk and tagged abandoned, mini-review. Bookmark the permalink. The Witch Elm…was that part of her Dublin Trilogy series or the same characters? I tried that series I believe and I just couldn’t do it. I don’ think at the time it was the character, but it was the story. It just didn’t grab me. No, this is a standalone unrelated to that series. I love her Dublin Murder Squad series (I think it’s ended now after six books, which makes me sad) but this one just didn’t cut it for me. Ah. And sorry for getting the name of the series wrong. I wanted to like them, but just didn’t. I think I read the first and part of the second. And sorry for the quick response. I happen to be off today from work (to add to my Christmas vacation, off until next Thursday) and am catching up on reading (and commenting on) blog posts. Oh that’s interesting, I really should pay more attention to the books I abandon. 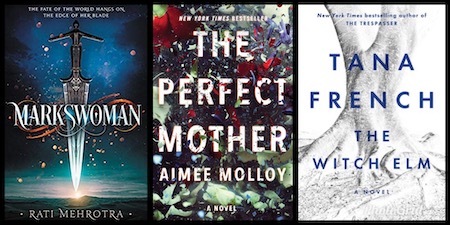 I’ve heard The Perfect Mother be compared to Liane Moriarty’s books but a little more thrillery… what do you think? I have this one on my shelves but haven’t gotten to it yet. I’ve heard that too, but I didn’t feel they were at all similar. I mean, it had a women’s fiction vibe mixed with a thriller vibe, but I felt the humor and depth of Moriarty’s work were completely absent.